“Don’t think I have come only to bring peace,” our Lord once told His followers. “I have not come to bring only peace, but also a sword” (Matt 10:34). For the world, proclaiming the Gospel of Jesus Christ has been both suture and sword, mighty fortress and stumbling stone, the fragrance of life and odour of death, a word that creates one, holy, united people from all nations and a word that can set father against son and daughter against mother. Peace—and a sword. What was true in our Lord’s day was true in the reformer’s days and is true today. Remembering that, we are not surprised not all welcomed the Book of Concord with shouts of “Gott sei dank! (“Thanks be to God!”). Book titles like Discord, Dialogue, and Concord and Concordia controversa remind us that it was the life-threatening lack of unity and agreement that called for the book’s publication. And, like every confession of the Truth, it brought peace—and a sword. First, it is the Book of Concord. In their fierce struggle to bring about concordia (harmony) among Luther’s followers, men like Jacob Andreae, Martin Chemnitz, David Chytraeus, and Nicholas Selnecker did not simply produce a new confessional statement. 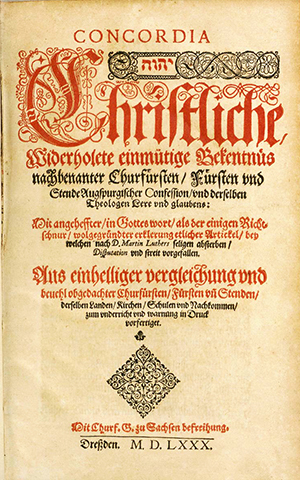 They gathered in one volume confessional writings that had provided guidance and unity through some of the church’s most difficult times (e.g., the creeds, the Augsburg Confession and its Apology, the catechisms of Luther) and confessional writings that could help the church address her current divisive issues. Moreover, these statements of faith point to the Holy Scriptures as the wellspring from which all true and pure confession flows. New challenges had not rendered old statements irrelevant; rather, the ongoing struggle for unity forced the church to return to these earlier statements of faith and, through them, to the Word of God. The Book of Concord was compiled in the Reformation spirit: this was no attempt to introduce a new teaching, but an attempt to understand and apply the self-revelation God gave the world in His Son, Jesus Christ. Robert Kolb makes a thought-provoking observation in an article on the Book of Concord’s index, tracing the development in meaning of “body of teaching,” in Latin, corpus doctrinae. The ten documents composing the Book of Concord were seen as a body of teaching which defined the public faith of a particular group of Christians in a particular place. In earlier times, the term had meant those documents in which a particular rule of faith could be found. Earlier still, the term simply referred to that rule of faith (analogia fidei), or interpretive principle, by which the Faith could be understood, taught and applied. And that brings us to the final point, real concordia is a matter of the heart. These writings strive to bring about in readers a unity going far beyond simply saying, “We accept this and that.” It is a unity brought about by making new hearts and transforming minds. It is a oneness coming from being born again and shows itself in a new way of thinking about and understanding creation, the history of the cosmos, the purpose of “it all,” and, most importantly, God’s Word. This oneness of heart and mind arises when we understand that all Scripture testifies of Jesus Christ. It is the oneness coming from believing and confessing that the message of the Scriptures expounded in the Confessions is that we are justified by grace through faith in Christ Jesus our Lord. Such unity can only come about through the reconciling ministry of the Spirit of Christ among us. In the closing decades of the sixteenth century, the Spirit brought such unity to thousands of Lutheran pastors and their congregations through the publication of The Book of Concord. But some could not accept this book immediately, and some could never accept it. The Lord’s work to unite His people in a faithful confession of His truth would continue—and continues through us.